Robyn, you are simply amazing! How come I have to know about this event in Pampangga from you? I have been dreaming of doing a Pampangga culinary tour! Just can't find them time because of work. In the Philippines, when you say a person is Kapampangan, he is understood to be a very good cook. I hope Mr. Medina will spearhead it. Just learned from MM that your Philippine cuisine article is coming out in Saveur mag. Thanks so much and congratulations to you and your hubby. Fantastic site as always! Have emailed all my relatives and friends in the US about your article in Saveur. I think you better notify Saveur that they may run out of copy soon. heehee...NO KIDDING! who's mr. medina? my dad maybe....(hahaha). for all those going to the festival, please look for DES RODRIGUEZ TORRES of the rodriguez clan of san fernando. any problems, inquiries, she will be happy to assist. 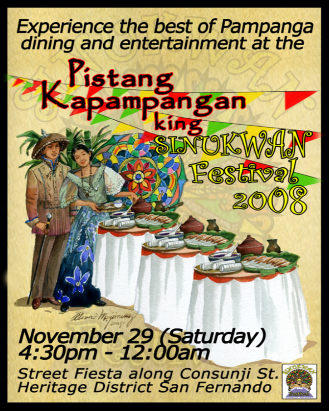 her brother ROLLY RODRIGUEZ and POCH JOROLAN of everybody's cafe organized the festival. Ever since I tasted the Wow Mani, I've been looking for it. When will it be exported here in U.S. so I can easily buy? where can i buy wow mani in metro manila? tried a lot of supermarkets to no avail. pls email nluciano94@yahoo.com. many thanks!